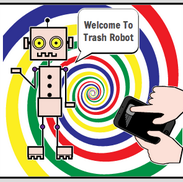 Trash Robot is a website/blog newsletter by Robert Bridge about robots, recycling, waste management and world information. This may still seem I little broad. Let me explain. I have been blogging here for over five years. Over the years I have created sub domains with forums on, created other websites designed with BaseKit to emulate what the company represents and joined in the conversations in Robots for quite some time. The plan has been very simple although not very effective, my hope is to steer this domain into another direction. I will be sending out posts via email, then at a later date archiving this mails here. I have never really committed to sending emails correctly to people and have found List wire my chosen email responder to be very tricky. I have had 388 prospects subscribe over the years where I posted on various sites and used all many recommended ways of list building. All to no avail. It seems if you do not keep up to date logging into auto responder then you waiver to contact those people on the list. Also there is a bit of a delay for subscribers to subscribe (so if you do opt in be very patient it will come and yes you do need to click the verify link). Just as a precaution I will say if you want to opt out of receiving emails leave me a message here so I can manually remove you from the system. A lot of people over the years have subscribed with the name of website or some other message. Please do not do this because I will just have to delete it.